Tada! You now have a shop! Click the item or the shop again, and you will be asked how much you'd like to buy. Simply input the quantity you wish to buy. Or if you wish to use a command, /buy as much as you want. Revenue from sales are stored in the shop, and are transferred to the player when they open or destroy the shop. Integrates nicely with area protection plugins. Only players who can open the shop can change its price, collect revenue, and create new shops in that area. All players are able to buy from a shop regardless of area protections. Prints a configurable help message that informs players how to create a shop and how to buy from other shops. Sets the price per item of a shop. Buys items from the selected shop. If configured, the player is asked to confirm their transaction, in case they made a mistake and to review the total transaction cost. Supports any block that is a Nameable Container - e.g. trapped chests, shulker boxes, even dispensers and furnaces if you so desire. Records shop sales, so you can see how popular a shop is. Supports custom items. Displays custom item name and lore. Players don't even need to know any commands to buy items. Clicking a shop twice will prompt the player to input the quantity they wish to buy from the shop. No sign formats to memorize! All shop data (prices, items, and revenue) is stored in the world! No messy, potentially-corruptible storage files! Shops are "future-proof" since the items for sale are stored in the actual chest and are converted by Mojang whenever they update blocks/items. It's easy to change the item you're selling in a shop. Just take out the old items and put the new ones in. Confirmation system helps players avoid mistakes and review the transaction before confirming the purchase. Supports all region protection plugins! No need to "allow use" or anything silly like that just to allow players to buy. Uses your economy's format and symbol. Nearly every message is configurable. 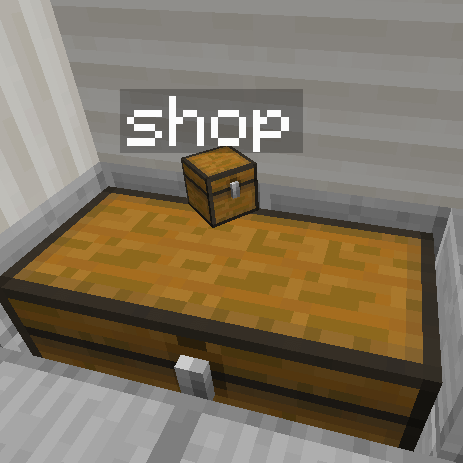 Chests named "shop" (or whatever you have set in the config) will help prompt players to create a shop with that chest. Useful if you "sell" shops to players. That is exactly what I am doing i'll put the items in the chest and write /setprice 30 and it doesn't seem to be working and says "/setprice <price> - Sets the price per item of a shop. Set to 0 to give away items for free, or set to -1 to disable the shop." Server log please. Sounds like you're doing something wrong. I am using Skyowallet, and Vault, but I can't seem to set a price with this plugin, I'm puting the Items into a chest, then go into the chat, type /setprice 2 (tried "/setprice 2 <currencyname>" too) but nothing seems to happen except I get thhe info for thhe command. Am I doing someting wrong? server log? Maybe skyowallet doesn't use vault? Thank you so much for creating this amazing shop plugin! I would appreciate this plugin support! Yea, we load after vault but apparently the economy plugin didn't get loaded yet. I really would like to avoid having to finish loading the plugin after the server has started but I may have to resort to that. Make a github issue so I don't forget please! Will this support essentials worth values? so that we can just have the price automatically pull from the servers economy? This is intended for players to setup and use, since the items withdraw from the chest and all. I don't have any intention to add any administrative shop features to this plugin but is entirely possible via an addon using its API.